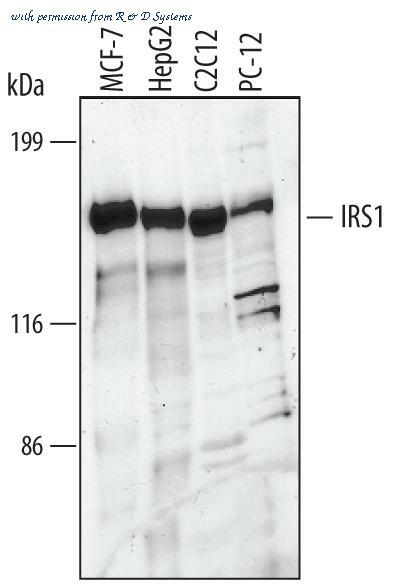 Detection of Human, Mouse, and Rat IRS1 by Western Blot. Western blot shows lysates of MCF-7 human breast cancer cell line, HepG2 human hepatocellular carcinoma cell line, C2C12 mouse myoblast cell line, and PC-12 rat adrenal pheochromocytoma cell line. 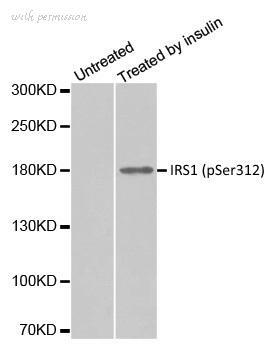 PVDF membrane was probed with 1 ╡g/mL of Goat Anti-Human/Mouse/Rat IRS1 Antigen Affinity-purified Polyclonal Antibody (Catalog # AF3978) followed by HRP-conjugated Anti-Goat IgG Secondary Antibody (Catalog # HAF017 ). 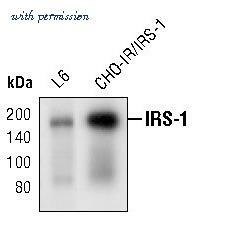 A specific band was detected for IRS1 at approximately 170 kDa (as indicated). 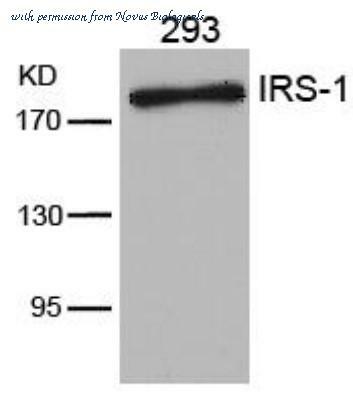 This experiment was conducted using Immunoblot Buffer Group 1 .